and the SHOWEOS table visualization tool which was developed to plot isotherms, isochores, isentropes, and Hugoniot curves. The underlying code of the FEOS package, MPQeos , is based on the EOS model QEOS  and was produced by A. Kemp et al. at the Max-Planck Institute for Quantum Optics in Garching at Munich. The motivation for the further development was a part of my diploma thesis which was devoted to an investigation of metastable states (superheated liquids) in volumetrically heated matter (thin foils) . The original MPQeos was in some parts not adequate enough for this investigation. Especially, I needed the EOS for mixtures of elements (fused silica or silicon dioxide) and a better description of the liquid-vapor coexistence region. With the applied improvements the new code can and will be now also used for other applications at GSI in Darmstadt, especially for radiation-hydrodynamic simulations. At this point I would like to thank Dr Anna Tauschwitz, Prof Dr Joachim Maruhn (both Goethe University Frankfurt am Main & GSI Darmstadt), Prof Dr Igor Iosilevskiy (Joint Institute for High Temperatures Moscow & GSI Darmstadt), and Prof. Dr. Mikhail Basko (Institute for Theoretical and Experimental Physics Moscow & GSI Darmstadt) for very helpful and constructive discussions during the development of FEOS. The calculated thermodynamic quantities are: pressure, specific internal energy, specific Helmholtz free energy, specific entropy, and charge state. The calculations can be done with or without a Maxwell construction which eliminates the van-der-Waals loops in the liquid-vapor coexistence region. For the calculation of the electronic contribution the simple Thomas-Fermi (TF) model  is used. In this model the electrons are described as a Fermi gas in the self-consistent electrostatic field of the atom. Matter is segmented into spherical cells for which the equilibrium electron distribution is calculated by solving the TF equation. Calculations with the simple TF model are faster than with advanced TF theories because all thermodynamical quantities scale with the atomic number and therefore must be calculated only once for e.g. hydrogen. The main two disadvantages of the simple TF model are the overestimation of critical pressure and critical temperature and the overall overestimation of pressures near normal conditions. The reason for this failures is the negligence of attractive (bonding) forces between neutral atoms in the simple TF theory. The so-called bonding correction , the recalibration scheme of QEOS, is added to the total EOS (or the electronic part) in order to improve the previously mentioned failures of the electronic contribution. It adjusts the EOS to zero pressure / energy and to the defined bulk modulus (and thereby sound speed) at the reference conditions. The ionic contribution is calculated by the Cowan model, a semi-empirical model which interpolates between known limiting physical cases (e.g. ideal gas law, Dulong-Petit law). As there exists no volume change on melting, melting is not included in the QEOS model. The constants A and B are adjusted in that way that total pressure and internal energy become zero at the reference conditions; m and n are free parameters. They are justified to approach the experimentally or theoretically known critical point. The disadvantages of the simple form of this new cold curve are on the one hand a lack of flexibility with only two free parameters. On the other hand sound speed is allowed to be discontinuous at the reference density. In these equations xk is the number fraction, and Ak is the atomic weight of species k.
The thermodynamic values for the electronic component of the mixture are finally obtained by summing up the single element values (with densities obtained by the above scheme), each weighted by xk Ak / A. 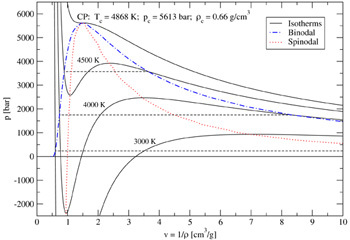 The described procedure is called for every density-temperature point, and therefore it is clear that the calculation of mixtures of elements is computationally more intensive than for a single element. Maxwell's rule is especially for low temperatures in the two-phase region computationally very intensive and imprecise. I solved this problem by adding a new routine for the coexistence data calculation. 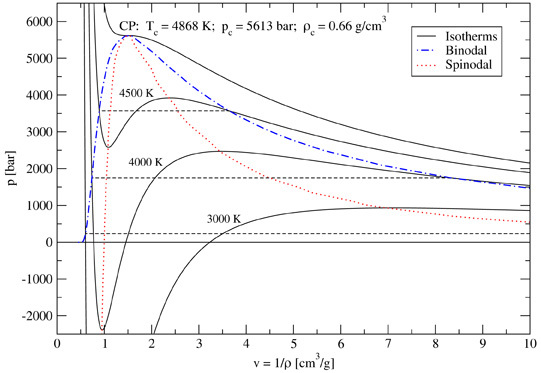 Now the coexistence boundary - also called the binodal - and the equilibrium or saturated vapor pressure are calculated with regard to the equilibrium of Gibbs' free energies and pressures on the liquid and the vapor side for each isotherm below the critical temperature. This leads to a large improvement of computational time and accuracy. Computer Physics Communications 227 (2018) 117–125, https://doi.org/10.1016/j.cpc.2018.01.008. S. Faik, An. Tauschwitz, I. Iosilevskiy; CPC 227 (2018) 117–125.